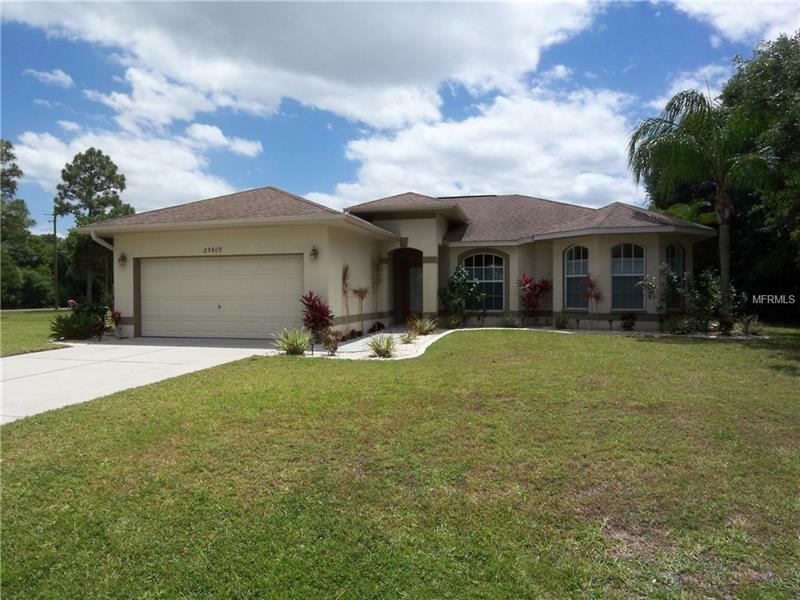 This 3 bed, 2 bath, pool home is a former builder's model and is nicely appointed and well maintained. It is a split floor plan with volume ceilings, tile in main living areas and carpet in the bedrooms. The kitchen features granite counters, stainless steel appliances and ample cabinetry. There is an eating space in the kitchen and the great room is a living room dining room combo with a view of the lanai and pool. Adjacent to the kitchen is a large family room, great for entertaining and also has access to the lanai. The spacious master has crown molding, carpet and leads to the master bath. The master bath has custom wood cabinets with soft close drawers, granite vanity, dual sinks and a shower. The screened lanai is perfect for parties or just relaxing by the pool which is nicely landscaped and has a greenbelt area behind it. There is a well for use with the sprinkler system or filling the pool. This home is situated in a quiet area of section 20 and is still convenient to shopping, schools and I-75. This move in ready home is an exceptional value so schedule your showing today.